Marinated Chicken is a Peruvian food recipe called Pollo en Escabeche. Wash chicken thoroughly and pat dry with paper towels. Heat oil in a large frying pan. Add chicken and brown on all sides. Add all other ingredients and stir to mix. Transfer chicken to a bowl and skim fat off top of liquid remaining in frying pan. 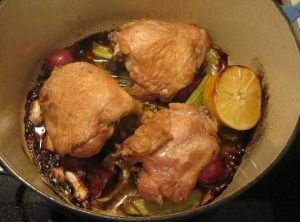 Return chicken to pan, cover, and refrigerate overnight. Serve cold.